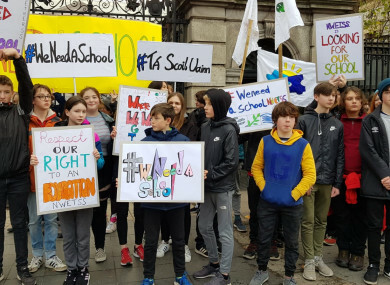 STUDENTS AND STAFF at the North Wicklow Educate Together secondary school staged a protest outside Leinster House yesterday, amid fears they’ll be left “homeless” from next summer onwards. Principal Jonathan Browner said the school is now making active enquiries to hotels and sports clubs about sourcing temporary accommodation for the school. The Department of Education has been accused of inaction on the matter, despite allegedly being aware for the past the two years that the current school premises would be unavailable from summer 2019 onwards. The school has also accused the department of not having a plan in place to transition the school from temporary premises to a more permanent solution. There is a particular worry for the parents of children with special needs that attend the school. They are said to be deeply concerns as the school has a designated class for them that has become a “positive part of their routine”. This upheaval could leave these particular students “high and dry”, according to Browner. He told TheJournal.ie: “The school that we opened is in a temporary location, and the private citizen that owns it has put it up for sale which is fair enough. [The department] knew the lease would be up on 30 April 2019. We’re looking for a definite timeline around a permanent location, which was announced in June 2017. We also want a proper temporary location until that’s built. He said that staff are doing their utmost to relieve pressure on students who face the prospect of not having a school in a few months time. He added that the department has simply reiterated the same line for some time now, with providing clarity on the matter. In solidarity with the Wicklow school, 55 students and 12 staff from the Limerick Educate Together Secondary school joined them at the protest yesterday. An online petition calling for Minister of Education Joe McHugh to personally intervene to build a new school and sort out temporary accommodation in the meantime has – at the time of writing – over 3,400 signatures. The Department of Education has indeed indicated it intends to build a new school, and has already identified where it will be located, but that it hasn’t yet found a temporary home for the staff and teachers before this is built. In a statement to TheJournal.ie, a department spokesperson said: “The department intends to build a new school for 1,000 pupils for North Wicklow Educate Together Secondary School. The site identified for this is on the campus of Bray Institute of Further Education, as there are no other suitable sites available in Bray. All options are being examined to find a new temporary home for the school and the Department is liaising with both Educate Together and KWETB. Email “'We've children at this school who've lived in homeless accommodation. They're effectively being evicted again'”. Feedback on “'We've children at this school who've lived in homeless accommodation. They're effectively being evicted again'”.